The document is the User's Manual for Rolandprintstudio v1.2. This document outlines the new features in v1.2. On Rolandprintstudio’s package box, you will find your Access number; this is the serial number of your software. On the USB dongle, you will also find a sticker with a number; this is the serial number of the dongle and is called the Dongle-Number. This document outlines the cutting feature in RolandPrintStudio. This is version 1.2. This how to guide gives detailed information on the Media Explorer. This is version 1.2. This document outlines how the repetition and nesting features in RolandPrintStudio. This is version 1.2. This document explains the tiling features in RolandPrintStudio. This is version 1.2. This Rolandprintstudio Quick Start guide describes how to print matte and gloss varnish with Rolandprintstudio RIP software with your VersaUV LEC and LEJ printers. This quick start guide makes installation of Rolandprintstudio easy. The guide includes how to install the software, install printer drivers, configure printer drives and import profiles (if avaialbe). Loaded with productive and time-saving features, RPS offers Mac OS X users a quick and easy RIP software solution for managing output on large-format Roland printers and printer/cutters. This video highlights how to use a print then cut workflow with Rolandprintstudio RIP software. This video outlines how to install a cutter driver into Rolandprintstudio RIP software. This video outlines how to use an instant cut workflow with Rolandprintstudio RIP software. This video outlines how to configure a cutter driver into Rolandprintstudio RIP software. This video outlines how to import media profiles into Rolandprintstudio RIP software. This video outlines how to configure a printer driver in Rolandprintstudio RIP software. This video outlines system requirements, registration, and installation for Rolandprintstudio RIP software. This video outlines how to load a printer driver to Rolandprintstudio RIP software. This video outlines how to load a license file unto Rolandprintstudio RIP software. ​Unable to print Roland Color spot colors from Rolandprintstudio. ​Rolandprintstudio no longer works after updating the operating system to MAC OS Sierra (v10.12). Unable to register the software on www.rolandprintstudio.com. The error message "Key not valid" appears. Rolandprintstudio no longer launches as expected. ​This issue only occurs after updating to XQuartz 2.7.10 or higher. When a user opens Rolandprintstudio RIP Software XQuartz launches but Rolandprintstudio doesn't launch as it should. Error message appers when trying to launch a printer driver. Message reads "Can't open RPC connection". ​Rolandprintstudio shows an expired license for dealer demo copies. ​There are no associated symptoms with this article. How to transfer a Rolandprintstudio license to another person. 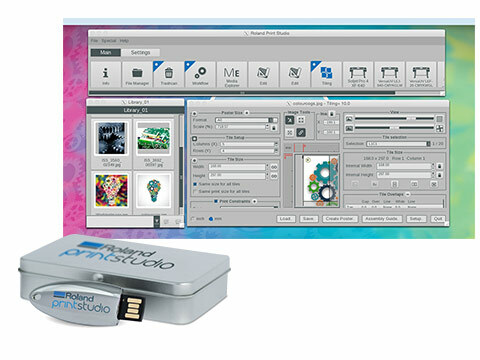 ​Rolandprintstudio software reverts to demo mode.